This is a review for the supplement Weyland Brain Nutrition Focus. The manufacturer claims that this supplement supports the brain’s function and focus. Read on to learn more about this product and whether or not it is the ideal choice for you. Alpha GPC- Works to provide support for acetylcholine neurotransmitter. CDP-Choline- Works to provide support for acetylcholine neurotransmitter. Phosphatidylserine-Works to provide support for acetylcholine neurotransmitter. DL Phenylalanine-Work to provide support for dopamine neurotransmitter. L-Tyrosine- Work to provide support for dopamine neurotransmitter. L-Dopa– Work to provide support for dopamine neurotransmitter. Please note: This product is vegetarian. Those with a restricted diet may fid this appealing. It is recommended that users take one to two capsules when necessary with both food and water. There were no possible side effects listed on the manufacturer’s website, but that doesn’t mean there are none. With this product containing caffeine, users should limit the amount of caffeine they consume, as it can cause nervousness and a rapid heartbeat. It was also recommended that anyone who is taking prescription medication, has a medical condition, is pregnant or nursing consult with a doctor before taking Focus. This product costs $24.95 for a bottle. Each bottle contains 40 capsules. This price is affordable for most. The manufacturer does not appear to offer a guarantee for this product. With no guarantee, customers may not be able to return the product if they are not satisfied. It is a risk purchasing a product that you cannot return and may ultimately lose money. There were many customer reviews available, many of which were positive, while others claimed the product worked very little or not at all. The fact that it did not work for some people may or may not be an issue since individual results may vary. If it did not work for someone else doesn’t necessarily mean that it will not work for you. 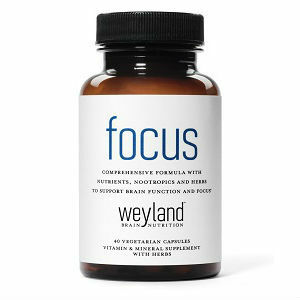 Weyland Brain Nutrition Focus is said to support the brain’s function and focus. The customer reviews seem to support this claim, as many have said the product works great. Another plus to purchasing this product is that the capsules are vegetarian. Those with a restricted diet will find the capsules appealing because many supplements are non-vegan and non-vegetarian. The price of this supplement is affordable for most, but the lack of guarantee may be an issue. There is a risk involved with purchasing this item because if you are not satisfied, you may not be able to receive a refund. However, a lack of a guarantee doesn’t mean that you won’t be able to return the product for a full refund. There may be a small window of time in which you are allowed to return the unused product and receive a refund. Overall, this supplement could work for you, but individual results may vary. Depending on what you are looking for, this product may or may not be the ideal choice for you. Henry Costa	reviewed Weyland Brain Nutrition Focus	on June 14th	 and gave it a rating of 2.5.